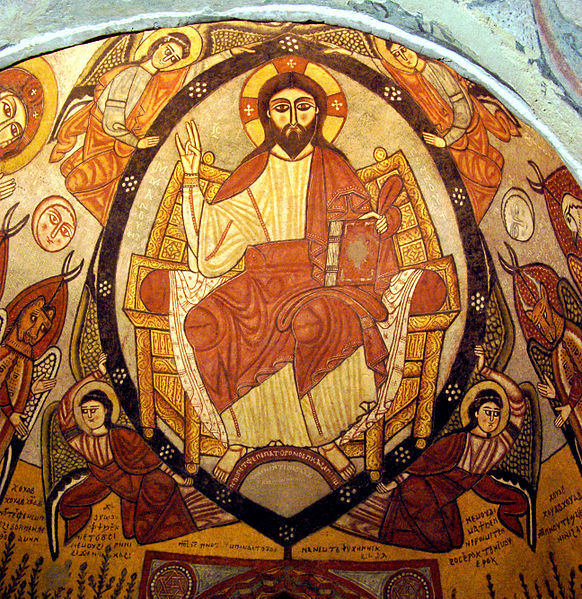 Christ regnant, from an apse at the Coptic Monastery of St. Anthony in the Eastern Desert of Egypt. Many in the West tend to look at prayer life as a mental thing: we praise, we thank, we confess to, and we confide in God – with words. And yet, some kind of bodily movement always accompanies our prayers. Indeed, a great body of Christian wisdom has long known that while we think or pronounce our prayers, our bodies, too, are at work expressing and shaping our souls. In the Coptic tradition it is the Liturgy of the Hours and the Divine Liturgy that become the occasions of formal psycho-physical prayer. Liturgical postures and gestures involve the whole person, for Christian prayer is not merely a mental activity, but rather one that proclaims and seeks to realize the union of body and soul. It recognizes, through the liturgy, that such unity is how God intended to create and save the human person. In the mid-twentieth century, monastic life in Egypt was in a perilous state: the monks were dying out, and their emptying monasteries were falling into dereliction. Yet by the 1980s old communities were bursting with vocations and new monasteries were being founded, largely due to the remarkable life of Fr. Matta El-Meskeen (Matthew the Poor), a pharmacist-turned-monk who served as abbot of the Monastery of St. Macarius in the desert of Scetis, Egypt, until his death in 2006. It was not only Fr. Matta’s rediscovery of the Church and Desert Fathers as sources explaining the monastic, spiritual and theological tradition of Eastern Christianity that brought about this renaissance; what attracted so many disciples was also a discovery of the validity of the asceticism in his own experiences lived out in the deserts of Egypt, in imitation of the authors who wrote of their spiritual experiences in the distant past. Fr. Matta was himself a prolific writer, authoring 180 books on a variety of theological, spiritual, liturgical, and social topics; some sixteen volumes of exegetical works on Scripture that consider both classical Christian exegetes and modern historical-critical scholars as sources; and over 300 booklets on a variety of topics, which have been translated into nearly sixty languages. One of the central features of prayer in the Coptic Church, particularly as it developed in monastic circles, is precisely that the body is continuously involved in various actions during prayer. Unceasing prayer has been a feature of Egyptian monasticism from its very beginnings in the fourth century. John Cassian’s Conferences with the monks of Egypt in the late fourth century witness to the importance of unceasing prayer while working. In his interview with Abba Isaac, John Cassian notes one of the many formulas used by the monks: “O God, be pleased to save me: O Lord, make haste to help me” (Psalm 70:1). Abba Isaac explains that the Psalm suits all occasions, whether a person is working, ministering to others, on a journey, going to sleep, eating, or even tending to the necessities of nature. While the ascetic practices and bodily postures of sitting in silence and repeating the Jesus Prayer using prayer ropes or beads (which are found in the hesychastic tradition of the Eastern Orthodox Church) never found their way into the Coptic Church, the monks and nuns did recite the Jesus Prayer and the Psalms from memory while they were engaged in manual labor. Coptic monastics were indeed wary of the hesychastic practices of the Jesus Prayer that developed later in the Eastern churches, and it may seem that such suspicion is somehow a teaching against engaging the body in formalized asceticism – for example, of sitting in silence and using the recommended breathing exercises. Yet the suspicion of hesychastic practice is not, in fact, a suspicion of the use of the body in prayer, but instead simply a rejection of the complicated system of hesychasm. Fr. Matta el-Meskeen, for instance, in his book on Orthodox Prayer Life, comments that hesychasm made the method of unceasing prayer lose its former simplicity. He claims that the method of unceasing prayer “shifted from its ascetical position as a humbling practice by itself to a mystical position, with programs, stipulations, technical and mechanical bases, degrees, objectives, results…” Instead, he prefers the simplicity of praying while working and in common human duties, which is likewise a practice found in both Eastern and Western Christian monasticism, stating that this allows for God to share in human work, and helps the person to discern God’s calling in regards to work. It is believed that work by itself does not help to save a monk or nun from distractions and temptations, but that the necessity of repeating short prayers along with working helps to keep the mind occupied. Labor mingled with constant prayer, whether short formulas of Psalms or the Jesus Prayer, allows the person to express his love for God continuously. This practice of praying unceasingly while working became one of the accepted forms of prayer in the Coptic Church. I did not believe my eyes when I began reading of experiences that most strongly told of my own. They expressed my hope and the joy of my life. So I decided to pray in the words of these sayings. I sat down to read each of them many times until they became impressed on my mind. I would then stand up to turn them into prayer, and then sit down to read again, and then stand up to pray in the words that I had just read, and so on. My spirit thus became aflame as if with fire….While reciting the saying of this or that Father, I would visualize him standing before me. I would then beseech him to clarify further to me the meaning of his words, and God would answer my plea. I would thus emerge every night with a new friendship with the spirits of these saints together with a knowledge and illumination that grew day after day. This knowledge evolved into an awareness of the different stages the spirit of [a person] undergoes in a life of prayer. On the other hand, the general practices of prayer that have been formalized in the Coptic Church are included in the personal prayers of the Liturgy of the Hours, which is called the Agpeya, and the communal liturgical prayers in the church. While most research on such prayer focuses on its theoretical foundations or the structure of the liturgy, the practice and symbolism of the body positions themselves merit similar attention. The involvement of the body in such prayer counters the dualistic separation of the praying soul and body which should at least not be a distraction. Yet, the body is essential in Coptic worship. Both mind and body participate in the incarnation, death and resurrection of Christ. From the very beginning the Copt’s prayer is physical: before he even addresses the Lord, whether in solitude or at church, he removes his footwear. This directly follows from God’s command at the burning bush, telling Moses to remove his sandals because he stood on holy ground. Coptic Christians carried on this Jewish tradition of removing the shoes, signifying the necessity of setting aside the cares of world, and at the same time recognizing the holiness of the locations of prayer. The body then accompanies his words by assuming three main positions: standing, bowing, and prostrating. To Western eyes such movements may recall popular portrayals of prayer in Islam, which always tend to show a group of unshod worshipers prostrating in a mosque. But while Muslim worshippers may appear exotic, prostrating is a common practice shared by all Eastern Christian communities, one that even predates the advent of Islam. How then do these customs function in Coptic worship? Standing facing the East is the most frequent prayer position. The person praying usually holds his or her hands outwards in the ‘orans‘ position, which is a common Christian position of prayer, frequently portrayed in ancient Christian art, including in Coptic iconography. At other times, hands may be kept down to the sides or held together as a sign of standing in humility before God. Some people choose to hold a cross in their hands as they stand in the orans position; in this case, the sign of the cross traced over the body ends with kissing the cross. Fr. Matta el-Meskeen explains that the kiss is appropriate, as the grace of encountering God in prayer was made possible through the Cross. It symbolizes the thanks offered to Christ crucified. There are some exceptions to standing continuously in prayer, such as for health reasons, but sitting is also permitted during the liturgical readings of the Psalms and the Epistles. However, during the recitation of the Psalms of the Agpeya, the common practice is to remain standing. The second main position is bowing, of which there are two kinds: a quick bow, and a profound bow. The quick bow involves a sign of the cross and a slight bow of the head when beginning to pray, and when glorifying God in a prayer, such as in the Trisagion and the Doxology. The second kind of bow, the profound bow, is where a person remains bowing for a short period of time to receive a blessing, an absolution from sins by a clergyman, or the blessing from Christ’s presence on the altar during the Divine Liturgy. 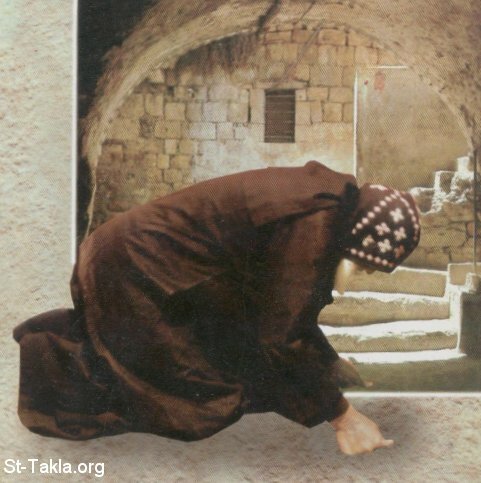 A Coptic prostration, from St-Takla.org. Two sorts of prostration, too, can be observed: one frequent, and the second reserved for adoration. In the frequent kind of prostration, the person begins by crossing himself. The person then holds both fists at a ninety degree angle to the body. Both thumbs are on the top of the fists, making the impression of the cross itself on the hands. The person then prostrates by kneeling down, and then moves the head down to touch the ground, while the knuckles and both thumbs touch the ground. It is strictly forbidden for anyone to prostrate with the palms of the hands open. Then the person immediately rises from the ground, and the whole process is repeated a number of times, depending on which prayer is being said. The prayers in which such a prostration is required are as follows: when one makes an entrance into a church and prostrates three times in the name of the Trinity in front of the sanctuary; when one begins to pray the Agpeya alone, prostrating three times in the name of the Trinity; at the end of each Psalm of the Agpeya, while saying the “Alleluia”; and multiple times during the more than forty Kyrie eleisons. The second kind of prostration is liturgical and the person does not rise up immediately. This prostration is one of adoration, and is common during the Epiclesis – that is, the descent of the Holy Spirit on the elements offered on the altar – in the Divine Liturgy. The person rises up to stand in prayer once the Epiclesis prayer is completed. Here the person prostrates to the ground without an initial sign of the cross, but then he assumes the same position as described above, with his hands in the form of a fist. His head, knuckles, and both thumbs touch the ground. Standing, bowing, and especially prostration are linked to the necessity of humility and reverence for being in the presence of God. Fr. Matta el-Meskeen notes that the reverence offered by prostrations is analogous to the reverence of Abraham in Genesis 17, where Abraham prostrates to the ground before the three divine visitors at the oak of Mamre, “as if he were dust and ashes, with a sense of utter contrition” before God, and who also remained standing before God to intercede for the salvation of Sodom and Gomorrah. The act of moving the whole body to the ground demonstrates the willingness of the person praying to be contrite in heart, and the touching of the ground with the forehead is reminder of his own mortality, returning to the dust of the earth – who is under the mercy of God, the only one believed to be immortal and life-giving. Likewise, standing before God with reverence and humility, in imitation of Abraham, is seen as the appropriate means of interceding for the world. The body at prayer also serves as a medium of expressing the Coptic Christian tradition: for corporal acts, one might say, can be theological statements. ‘Reading’ them like this is known as a typological interpretation. In this way the Old Testament’s events and personalities are allegorically interpreted in the light of Christ’s revelation in the New Testament. Thus, a typological interpretation finds bodily movements as particularly rich bearers of Christology. On the other hand, the actions of the body in prayer and this theology affect the praying person’s psyche, as we have seen, for example, in what Fr. Matta relates in his own experience of lectio divina. This view offers what would be called a tropological interpretation, which in turn shows how the body is a medium for theological anthropology. In terms of the typological interpretation of the body as medium of Christological faith, the worshiper emulates in his standing, bowing, and prostrating the Semitic, Hellenistic, and Roman positioning of the body before rulers. These bodily postures, practiced in front of a secular ruler, were later incorporated liturgically, and as such they were seen as appropriately reverential postures to assume before Christ the Pantocrator (“ruler of all”). This is further emphasized in the fact that Copts pray facing the East, waiting for the return of Jesus in glory; his return as the enthroned Pantocrator is portrayed in the iconography that is placed before the worshippers. In this way, standing, bowing, and prostrating for prayer transform the body into a medium to express the Lordship of Jesus. Furthermore, the act of prostration expresses a powerful Christology. The prostration to the ground expresses the belief in the kenosis, or emptying of glory, of the Son of God. So, this becomes an act of affirming the incarnation of God. Prostrating to the ground and touching the ground with one’s forehead is a further expression of the link between the person and returning to the dust of the earth in death; it expresses the willingness of Jesus to humble himself in obedience to the Father even to the point of death. The holding of one’s hands as fists with the thumbs on top, as well as the sign of the cross before prostrating, express the belief in the victory Jesus won through his crucifixion and resurrection in the battle with sin and death. The position of prostrating with the palms of the hands open is interpreted to mean ‘falling down in defeat’, and it is for this reason that Copts forbid it, wishing to emphasize the victory over evil, sin, and death through the Cross. Finally, the rising of the person from the ground is an affirmation of the resurrection of Jesus. Thus, the act of prostrating becomes a medium of expressing the whole of Christology and salvation history: the kenosis and incarnation, the crucifixion, and the resurrection from the dead – in all of which the person participates by imitating Jesus through the actions of the body in prayer. Likewise, the act of falling to the ground serves as a reminder of being mortal, as the biblical narratives of both Abraham and Job engaging in the act of prostrating to the ground and saying that they are “dust and ashes.” The falling to the ground is a display of the equality of all humanity in terms of mortality and weakness; and the need for God’s mercy to give the grace of immortality and incorruption. Prostration to the ground bears witness to the equality of all human beings – regardless of their status in society or virtue – before the Creator. Prostrating is a statement that can demonstrate the virtue of humility, and is seen as an act that can help overcome the vices of pride and honor. Falling to the ground allows the person to remember his own weakness in the presence of God. Another tropological interpretation concerns the position of the body in relation to the human psyche. During prostration the worshipper assumes the fetal position. One may note its Freudian connection with regression, which, according to Freud, is a neurosis and a defense mechanism of a person who feels small, weak, and helpless. Just as an unborn child feels safe in a mother’s womb, so too, Freud suggests, the fetal position brings comfort to a grown (if regressive) person. While prostration is not necessarily a regression in the neurotic sense, it may be that in assuming such a position of self-abasement and humility, Coptic Christians find comfort and strength not in their own power and status but in being in the presence of a God who protects his children as a mother does the child in her womb. Then, in rising up from the ground, they express the belief in the strength, courage, and victory over evil, all of which a person shares in through grace. Rising from the ground after prostration is an acknowledgment of salvation. Thus, the body at prayer, according to the Coptic Church, is a medium of expressing the whole of Christology, salvation history, the repentance of an individual, and the rising up to a new life, both in the present life and at the eschaton. When we limit our notion of prayer to what we think and what we say or sing, we neglect a great part of what we are: corporeal. But in excluding the body we also miss a symbolically and experientially rich mode of worship, one that in fact safeguards and transmits the content of faith. Bishoy Dawood is a Ph.D. candidate in Theology at the University of St. Michael’s College in the University of Toronto. His English translation of the Coptic Liturgy of the Hours, the Agpeya, can be found at Agpeya.ca. A.G. Martimort et al., The Church at Prayer, Volume I: Principles of the Liturgy, trans. Matthew J. O’Connell (Collegeville, Minnesota: the Liturgical Press, 1987), 179. Fr. Matta’s seminal work in Arabic, The Orthodox Prayer Life: The Interior Way, contains personal notes of his own experiences as a solitary hermit in the desert, and was based on his reflections on the Bible, an Arabic translation of the ascetical works of Isaac of Nineveh, and an English translation by Archmandrite Lazarus Moore (1902-1992) of a Russian collection of sayings on prayer by classical and modern Church Fathers. In the final, seventh Arabic edition of this book, published in 1995, one can notice a number of quotes and references by Fr. Matta to currently-established authors on the spiritual life, which were relatively unknown in the 1950’s in Egypt before being re-discovered by Fr. Matta. References include the Letters of Antony the Great, Isaac of Nineveh’s Ascetical Homilies, Macarius the Great’s Spiritual Homilies, John of Dalyatha’s Homilies, John Cassian’s Conferences, John Climacus’ Ladder of Divine Ascent, the Confessions and other spiritual works of Augustine, and a few sayings from the Philokalia. Fr. Matta even considered Eastern Orthodox sources outside his own tradition: he references Seraphim of Sarov and Vladimir Lossky’s The Mystical Theology of the Eastern Church. The Orthodox Prayer Life was translated into several languages, and the English translation was published by St. Vladimir’s Seminary Press in 2003. Abba Isaac, “Conferences of John Cassian” 10.10, in Owen Chadwick, Western Asceticism: Selected Translations (Philadelphia: Westminster Press, 1958), 239-243. Matthew the Poor, Orthodox Prayer Life: The Interior Way (Crestwood, NY: St. Vladimir’s Seminary Press, 2003), 209. Matta El-Meskeen, Guidelines for Prayer (Scetis, Egypt: The Monastery of St. Macarius, 2004), 7. Matta El-Meskeen, Be Transformed (Scetis, Egypt: The Monastery of St. Macarius, 2005), 25. This was a fantastic read, I never realised just how significant bodily worship is, not only in proclaiming the theology of God, but also in demonstrating the reverence of man before his Creator. Thanks for sharing, God bless your ministry. Would your fist be with your thumb sticking out or flat?